Roisin Kincade is a young, talented, full stack techie. Her mind is full of thoughts, ideas, film quotes and analogies. She knows and understands Flow, allowing herself to be in the zone when coding. That takes it out of her. Dropping out of Flow, as she did that night, means inattention. She is not a great fan of command lines, nor of systems admin, at the best of times. Finishing a long coding session she just had to do some minor file system tidying up. We have all done it, typed the wrong thing into the wrong window, deleted the wrong file, messaged the wrong person. This time she typed a Linux command in the wrong place. She missed the terminal window and managed to Tweet the World instead. She expected the public ridicule, the trolls and the bot responses, but she did not expect an automated Direct Message. Neither did she expect to spend the next few days using a game engine to help her talk to a new system. It seemed like she was hacking an old school text adventure game, by invitation, but it was much more! 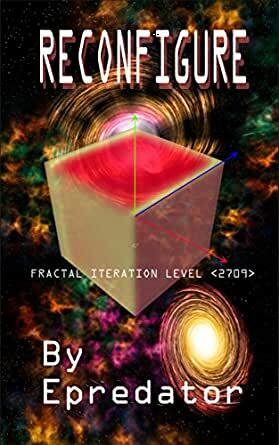 A world of Fractal Iterations, Quantum Computing and strange side effects opened up. It appeared to offer a programming interface to everything around her. Epredator / Ian Hughes is a metaverse evangelist. He has worked in unusual and emerging technologies in both a corporate setting and out in startup land. He specialises in using game technology, such as virtual worlds to help people communicate and understand concepts. Being a techie, and working across many mediums he has used social media since before it was as social as it is now. Blogging and sharing ideas is a core part of who he is. Science Fiction is a natural genre and his first book was spawned from using and developing software for virtual environments. He was resident super geek on a UK TV show called The Cool Stuff Collective for 39 episodes from 2011-2011. He was able to share his enthusiasm for new technology with the next generation, as well as working alongside a monkey, a cave girl and a host of other characters. In the third series he got to relive his own saturday morning childhood TV memories by flinging custard pies at people too. His epredator handle is common across most games and platforms. It is part of his online persona, but heavily integrated with his real life one. Things may be digital but they are still real. He used to use just Predator because he was good at instinctively hunting down bugs. However, then the 20th Century Fox movie and characters appeared and it became a much more common name and handle. The Yautja offering an honourable and strong character to identify with too. In the late 90's everything was getting e put on the front of it, ebusiness, ecommerce. So in part a joke he added the e. It stuck. Epredator became a well known handle through the rise of virtual worlds such as Second Life in 2006-2009. By sharing his ideas with colleagues he became known as a metaverse evangelist. Travelling the world explaining why you don't need to travel the world when you can meet in a virtual world full of expression and fun. He is not all digital though, he is a Head Instructor in the self defence martial art Choi Kwang Do. His wife and two children (the latter are both now black belts too) all practice the art. Being a systems engineer myself, I'm quite picky when it comes to reading novels that claim to be based on technology, informatics, internet, etc. and I tend to critique them pretty hard. Let me tell you, Reconfigure didn't disappoint me one byte! Ian Hughes is a man who has been into virtual reality and cyber worlds for quite a long time, having a quite well known name in the Second Life community as Epredator. His experience and research in the tech field are perfectly reflected in the writing of Reconfigure. Everything that happens in the story, except for the obvious sci-fi elements, is posible either right now with today's technology, or will be in a very near future, and being a techie, that fact delights me. We follow the adventures of Roisin, a programmer who by some fortunate (or not) coincidences, accidentally finds herself able to use her tech knowledge to modify the real world as if it was a computer program like the ones she has been working with all her life. What she did not know and would find out soon is that there are hidden powers in this world who are more than interested in what she just discovered. She will find herself involved in a war she has to fight by herself. Fast paced and with a cinematic flow, Reconfigure had my attention 100% of the time, I just wanted to finish the current page so I could find out what happened in the next, and before I knew I had finished the book. Good thing there is already a second part out! If you like cyberpunk, or sci-fi in general, I would blindly recommend this book. If you don't, I still think you should give it a chance because it's just that good. Sci-fi thrillers have always intrigued me, and when one is written by someone so clearly knowledgeable in the field of computers and experimental technologies, it makes it even better. I must admit, I didn't know what I was getting into when I first started, as there is a decent amount of "assumed" knowledge from the author, which could make this a bit inaccessible for some readers. However, once you get into the flow of the tone (and the very original writing style), it becomes easier to follow, and downright enjoyable. I feel like the concept of the book, being able to control the real world in such a tangible way, was filled with possible pitfalls and I was worried that the writing would get bogged down in the mechanics of it, but I found that wasn't the case. The beginning of the book was heavy on exposition, but Epredator quickly found his stride, and as the suspense and tension of the novel grew, and the wrong people come calling on Roisin, the pace of the novel keeps up. You're not able to ever shut your brain off while reading this incredible book, namely because if you blink or skim a paragraph, you might miss crucial details. The prose is densely packed and filled with details - a credit to Epredator - but also a challenge for readers looking for easy summer reading or pop fiction. This is sci-fi thrills at their best, and a wildly unique concept that the author explicates and explores from a very cool angle. The first few chapters I found to be a bit heavy with all the techie background, but you could still see the start of an intriguing story. Do you need to have a science degree to understand this book? No, not necessarily but an appreciation of the sciences would certainly make the reading of this story more pleasurable. This is not a quick read but a mind boggling one filled with surprising twists and turns. It gives a taste of what life might be in the future with the advances in technology. But as long as there is the human ego there still will be scrimmages for power. And here we see brilliant Roisin always keeping a step ahead of those threatening powers. The author - Epredator, clearly knows his way around the world of computers, internet and advance technologies which is shown clearly in Reconfigure. Reconfigure is such an advance form of the sci-fi thriller variety, totally advance - way out there! First off, I am not a computer programmer, nor am I knowledgeable about how it is used. This did cause me some issues while reading, because I do not have the frame of reference required to be able to just "go with the flow" of the book. I found myself having to re-read pages and double-check that I hadn't inadvertently missed a paged. That being said, the plot of the book was interesting, and I kept working to read the complete work. I am sure I did not get as much out of it as someone who works with computer systems and programming would, so I feel that this would be geared towards those who can understand the technical language, a special niche within the sci-fi genre. A clever journey into the techie networked world, where the least action can have the most dramatic impact. Deftly written in the "near-future" sci-fi style that extrapolates current global culture, and interprets the possibles we are living toward. This is a fun read, with Hughes' confident prose tackling programmer culture with an insiders understanding, and a keen sense of how the techie world profoundly influences the world around us. This is a great read, one that will having you hoping there is another story ahead for "epredator."